You can see how popular a show is from the trolls. My love from another star seems to be at its peek now! eh, you know YFAS is the most popular k-drama on right now so you'll be getting some pushback speaking negatively about it any way. That post was linked on viki's YFAS comment page which has about a 1,000 comments right now so not trolls but serious fans of the show. Trolls are usually much, much meaner....I agree with some of your points also...I started out fascinated but I'm getting bored as it goes on. Ahjusshi! These comments coming from your blog? Bravo! You got some true commentators there and mostly disagree with your opinion. But they aren't bad though. I've seen worse. 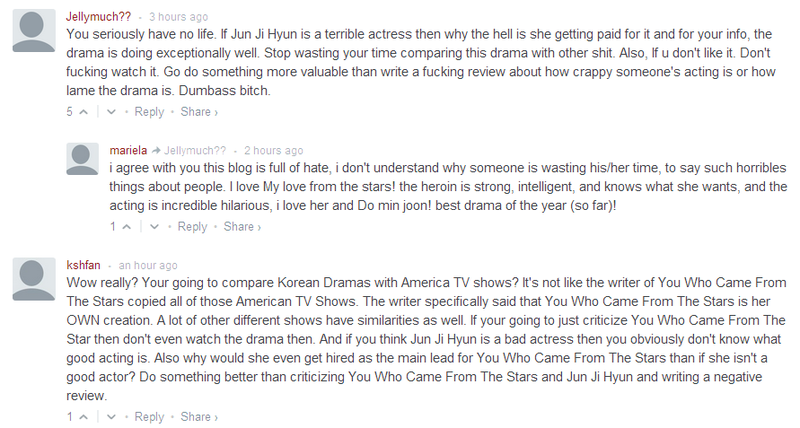 But I do agree with one that you need to stop comparing with the western dramas. Not nice of you to do that, as we are trying to promote Asian dramas more and more and by comparing it, you're degrading the rising of Asian dramas to non-Asian viewers. You got give them so prop too. Where is the love? I like the show by the way. But then again, since you know me by now, I live every shows playing now LOL. You crack me up big time! I agree with your review! Too many redundant plots, the hell, why are they keep dragging the series longer and longer? The blessings are the OTP. Without them, I would yawn forever. I love their quirkiness. I can't tell now if Jun Ji Hyun is bad or not but she's rusty. Drama is just not her forte... She's best with movies and that she should going back to do more movies. But (here's my redundant mind) I do like her here and love her goofy character.